Injuries to horse and rider often occur on a third party’s property. It is becoming more commonplace for horse trainers and stables to have the rider and/or horse owner sign a release of liability before any riding or boarding can take place. There are many factors to consider in determining whether a release of liability will be enforceable when an accident does occur. While it is wise to consult an attorney when an accident happens, a few of the things to consider are discussed below. The vast majority of states have adopted equine activity statutes. Apart from any written waiver or release of liability, these statutes also serve to protect the party providing equine activity providers. Oftentimes the language of the statute is mirrored in the release of liability document, which is a recommended practice. 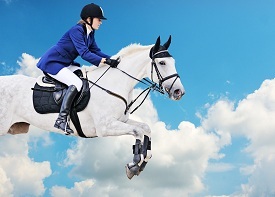 Equine activity statutes vary from state to state, so it should be independently consulted in connection with reviewing the enforceability of a waiver document. Is the Release Language Clear? It should be determined if the language of release is clear and unambiguous. Is it broad enough to release everyone involved in the accident? Does the waiver or release clearly describe the potential harm that the signatory is releasing? Or is it confusing and hard to understand? These are important factors to consider when evaluating the strength of a release. For example, if a rider releases a farm from liability for personal injury to the rider, but later the rider’s horse steps in a hole and ultimately must be euthanized, the release will likely not apply to protect the farm from a property damage claim. Further, if that same rider is injured due to the negligent acts of her trainer, but she has only released the farm from liability, she may still have a claim against the trainer. Most jurisdictions hold that in instances of gross negligence or intentional acts, a release of liability will not apply. Gross negligence is a conscious and voluntary disregard of the need to use reasonable care, which is likely to cause foreseeable grave injury or harm to persons, property, or both. It is considered to be extreme when compared with ordinary negligence. Intentional acts likewise cannot be released. The intent is referring to an intent to do harm. Additionally, oftentimes liability or care, custody and control (CCC) insurance will not cover a policyholder’s intentional acts that cause harm. Reviewing your jurisdiction’s Equine Activity Statute is a starting point for evaluating potential liability in the face of an accident. The release itself should then be carefully reviewed while considering the specific facts of the accident, and a determination can be made regarding whether the document will release the potential target of a liability claim. Tagged with: subro subrogation equine "equine law" "equine insurance" "equine activity statute"